DISNEY ON ICE PRESENTS DARE TO DREAM Takes Adventure to New Lengths with Magical Moments From Disney’s Newest Fairytales and a Timeless Classic COMING TO SALT LAKE CITY, MARCH 6-10, 2013 Join a celebration of royal proportions when Rapunzel, Tiana and Cinderella star in the all-new ice skating production of Disney On Ice presents Dare to Dream! 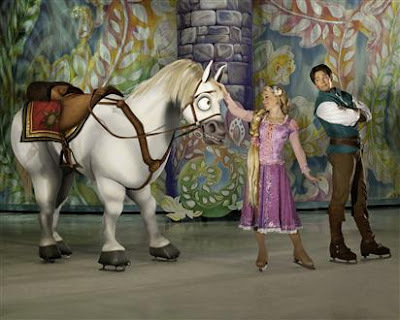 Relive memorable moments from Tangled, The Princess and the Frog and Cinderella as a cast of world-class skaters brings the romance, humor and adventure of the films to life in this contemporary skating spectacular. Combining the contemporary stories of two modern-day princesses, Rapunzel and Tiana, with the classic elegance of Cinderella, Dare to Dream whisks audiences away on exciting journeys where dreams really do come true. READ MORE about Disney On Ice: Dare To Dream. Tickets go on-sale Feb 1. Prices range from $17, $23, $40 (VIP) and $52 (Front Row). * Opening Night discount tickets available for only $12 each. (not valid for premium seating) All seats are reserved and available from the EnergySolutions Box Office and all SmithTix locations, charge by phone at 801-355-SEAT or 800-888-TIXX and online at www.smithstix.com or www.energysolutionsarena.com. *Tickets may be subject to service charges, facility and handling fees. By using this code, MOM, at checkout readers can receive discounted tickets for the Thursday at 7PM, Friday at 3:30 PM, Saturday at 11:30 AM, Sunday at 1:30PM and 5:30 PM performances, for ticket levels of $23 and $16.